Emerald Creek Dares: Bringing bits of Cheer! First we want to wish our American Friends a Happy Thanksgiving! 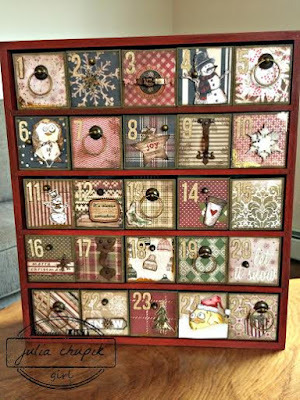 Today we have so much fun for all of you holiday crafters. It was difficult to narrow our crafty works to 1 item, but you don't have to. 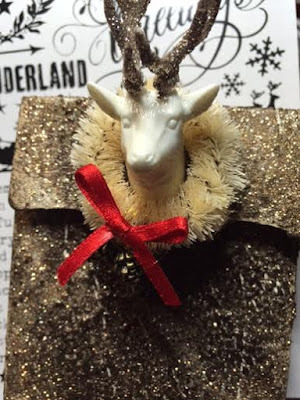 Show us all of your holiday creations! Katelyn combined awesome black and white layers, to bring you "Warmest Wishes"
Karon's didn't miss a detail when wishing us a "Merry Christmas"
Congratulations to Deb of Paxton Valley Folkart, winner of the Remember the Fallen Dare. Deb please email Kim at admin@emeraldcreek.ca for your prize code. Please email Kim, admin@emeraldcreek.ca and tag Top 3 for your Badge to post on your Blog. Thank you EVERYONE, for all of your entries into one of the most import dares to me. OMG! That's what I call DT galore! You all really knocked this one out of the park! Gosh - am I in advent mood now. lol. Thanks for the lovely and magical inspiration! congratulations to Deb!!! your tag was / is beautiful!! and to my fellow design team.. holy wow!!! off to take a boo at your projects!! Congratulations Deb! Your poppy tag was stunning. A well deserved win. Have fun shopping! And to my fellow DT's ~ wowzers! I'm off to visit your blogs for festive inspiration! Wowsers, ladies! What a beautiful line up of Christmas creations! Really gorgeous! Congratulations to Deb, and all of us, for that matter! 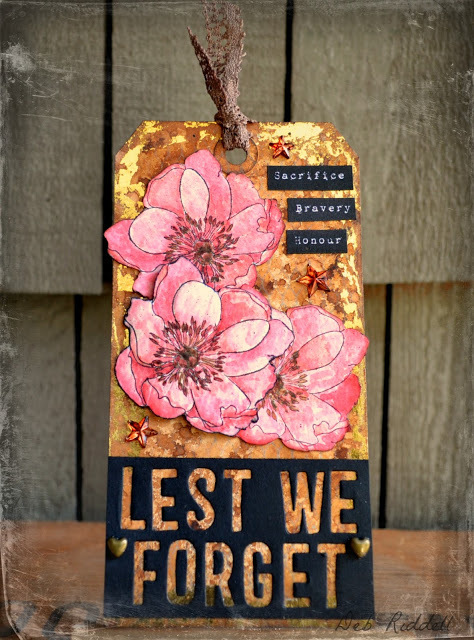 Deb's tag is a lovely tribute to the fallen veterans! Kim, It looks as if I'm going to have to comment on your make here...I love all that glitter on the trees or is that Soft Fallen Snow? Santa and his sleigh look great magically flying across your moonlit sky! Beautiful Christmas scene! Hugs! LOL Sara, you're awesome. I will hopefully write up the directions for the weekend. It's been hectic with a funeral and classes starting. 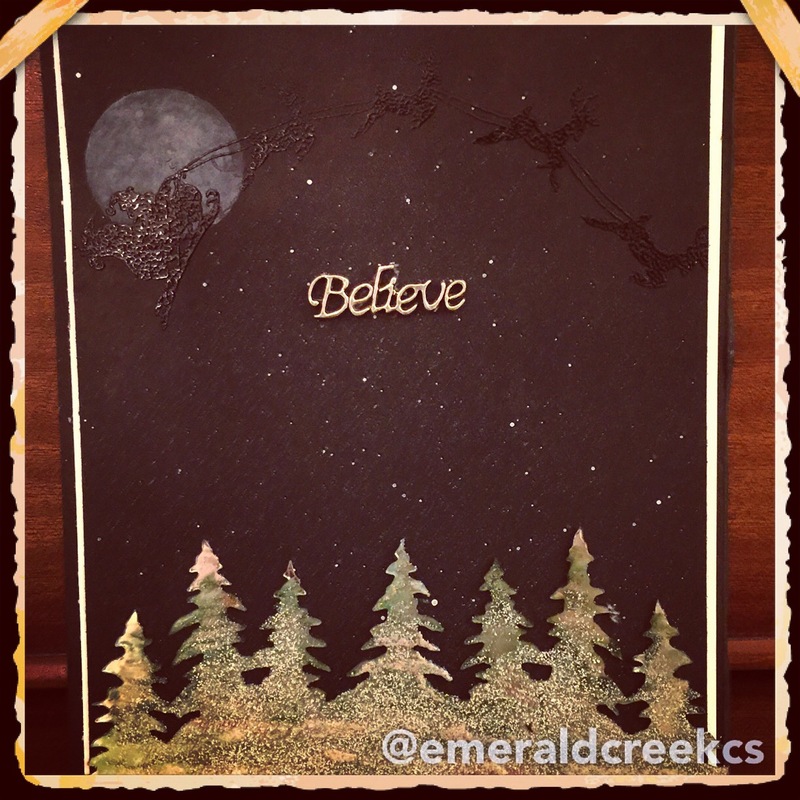 The trees are Tim Holtz mirror and edge die I brushed them with a mix of lucky clover and walnut stain and then yes it was a very light dusting of the snow powder and heat setting before the paint fully dried. Congrats on your win Deb!! Your tag is beautiful!! DT...amazing as always, you all inspire on a regular basis!! WOW, the DT is on Holiday fire! 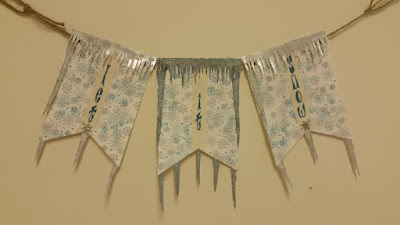 Each project is so thoughtful, festive and covered in icicles and snow! I loved seeing everyone's project. Such fabulous inspiration! Lots of Christmas inspiration here!! And all so different in design; NICE NICE!! 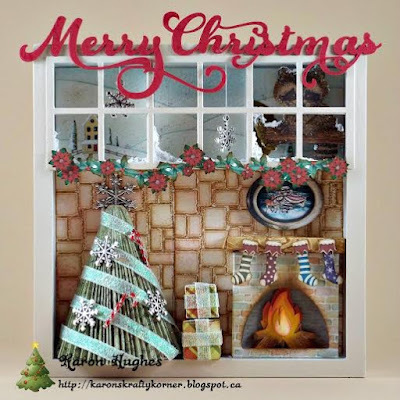 Thank you Cathy Petosky for stopping by my blog and recommending me to upload my Christmas Lantern project for this challenge - Lots of great inspiration by the DT - have a blessed week! Question about the challenge - what is the limit to upload projects? I see this challenge is unlimited - is there a set limit for future challenges? I am new the blog -being sent over by Cathy P - thank you Cathy -have a blessed week! I don't plan on having a limit yet. I'm so small and haven't had more then12-14 entries so add away. If it comes up maybe I will cap it at 5 but j don't intend to stop the creative sharing yet :). Thank you for the excellent question and things to think about for the future. Thank you Kim - Cathy was so kind to tell me about your challenge - there are some great displays here - must to learn from others - have a great week! I tried a third time, silly me, but I still don't see it. I have the proper link to your challenge in my blog post so I'm really not sure what I'm doing wrong. 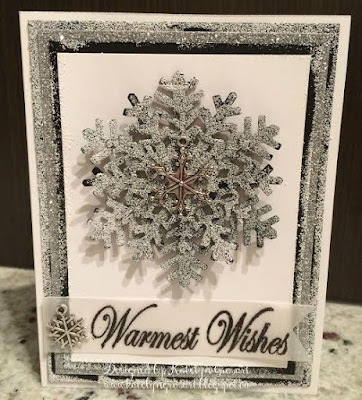 I've entered 3 times with the same blog post, but I think it's okay because my blog post contained 3 items: a card, tag, and snow globe. Thank you so much! Welcome and thanks for joining us. I will check you post later today and help you link up and then let you know if I found an issue from your end or mine. Okay, I was finally successful! Still unable to link up with my blog but I entered using Flickr. Hope that's okay. There's a link to my blog post on the Flickr photos and also in the comment above. Yay! I was finally able to link up!. So bizarre but at least it's up and linking through Flickr is good enough. Gorgeous designs by the lovely DT! Congrats to Deb and everyone for their tributes to our soldiers. And thank you for the top 3. We shall meet again soon. Happy Thanksgiving! Fabulous inspiration from the Design Team, thank you for the challenge. Thanks, Cathy, for pointing me to this challenge. Beautiful projects by the DT. Beautiful wreath! Thank you for entering with us! Hi Kim - I was going to stop at 5 but I am so happy how my sled turned out I wanted to post it here - sometimes I amaze myself and I really do not mean to be bragging on me - but I am just amazed I got this sled to look like this by mixing chalk, markers, and ink - So sorry about the technical difficulties - I sent an email regarding #3 upload here - have a blessed evening. I am thrilled you decided to join us, Christi! Hi ladies - I'm new here too, having been referred by Cathy P! Love your site and you'll be seeing a lot more of me! All of your DT inspiration is amazing! Hello Leslie. Thank you so much for joining in and thank you Cathy for promoting us. We are so excited to see so many new and projects joining in on this challenge. I just discovered that the post for my card, #23, did not contain the back-link and your badge. I have fixed that now. I'm sorry about that! No worries. Thanks for double checking. So excited that you entered! Oh my word! How did I miss his.... AWESOME projects by the DT. Thank you so much for stopping by ... and leaving a reminder. Have an amazing day, Cathy. 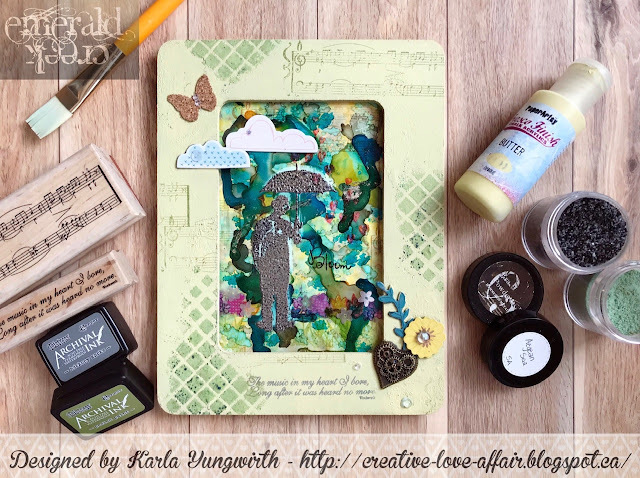 Our First Guest Blogger, Katelyn!